Krome Studios' remaster of the original Bard's Tale trilogy was supposed to be released on Steam Early Access last month, with only the first game included initially. However, in a brief Bard's Tale IV Kickstarter update on the day of its intended release, inXile informed backers that they'd changed their plans and now intended to release the trilogy as a regular product at a later date in mid-August, though still including only Bard's Tale 1 at first. The episodic (for lack of a better term) remastered trilogy now has its own pages on Steam and GOG, with an exact release date of August 14th. According to inXile's press release, it'll cost $15. The second and third chapters in the trilogy are scheduled for release this fall and winter, respectively. Here's the launch trailer, which prominently showcases the remaster's new animations. In actual Bard's Tale IV news, today's Kickstarter update features a list of changes and improvements that inXile have decided to implement based on player feedback. Some of these changes should make our resident blobber purists a bit happier. We were thrilled with the reception of the beta both from the public and our backers, particularly through the submission form link that let players give their feedback directly from the game. It was great to read all the kind words, and even where there was criticism, it was constructive. On that note, we've been poring over the comments and data in the near-month since the beta's release and discussing it in-depth daily. We are now at a point where we can share some early feedback from the dev team on your comments. As we begin to implement fixes and other tweaks, we wanted to give you an update on some of the changes we have planned for the launch version of the game (as well as some changes that we are considering) thanks to you. Here's a list, along with a call out of some of the many names whose comments were read and considered. Courtesy of feedback from users such as Zortok, we are increasing the number of mastery slots from 3 to 4. Courtesy of feedback from users such as mdntblue, we are working on granting mercenary tokens earlier so that you can make you own characters sooner. Courtesy of feedback from users such as dpisacane, we are speeding up how quickly you get to six party members. Courtesy of feedback from users such as Paranoiac, merchants will have multiple pages so that it is easier for you to sell your stuff. Courtesy of feedback from users such as Sirtechfan, along similar lines, we’re tuning the item economy for the early part of the game based on your feedback. Courtesy of feedback from users such as Drool, we are working on improved ways to compare items in the shop. You will be able to compare items in a store with items equipped on your characters. Courtesy of feedback from users such as Nystrom, one quality of life feature for inventory: we’ll have pages for inventory items, lore items, and quest items so players can more easily track/understand what they are picking up. Courtesy of feedback from users such as lemiarty, starting inventory will be larger. Courtesy of feedback from users such as Jalis, after the eight main narrative quests, there will be significantly fewer waypoints telling you where to go. For the most part, it will be a destination marker and that’s it. Courtesy of feedback from users such as Omelet79, we are adding a cost to resetting your characters’ skill trees. It is no longer freely available anywhere. You now pay using a mercenary token at the Review Board to do so. Courtesy of feedback from users such as Entrei, adding a “surrender” button on combat that allows you to reload your most recent checkpoint rather than play out a losing combat. We will be sure to add a “Are you sure?” double-check to avoid any accidental activations! 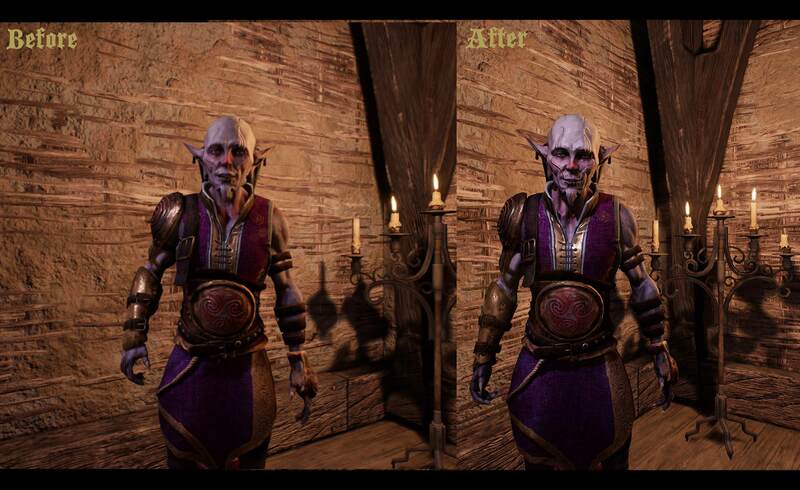 The update also includes links to all the recent Bard's Tale IV previews and a glimpse at one of the game's character models that inXile have polished for release. Perhaps the game will meet the high graphical standard they set for themselves during the Kickstarter after all.